TouchProbe - iBR9000 Guard Tour Systems are used around the world every day by security guards to automate their jobs and provide verification they are performing their guard tour patrol job correctly. The guard tour patrol system uses rugged data collection hardware and powerful yet easy-to-use software designed and manufactured in the USA. The guard walks his rounds and touches iButtons at each designated location to provide verification of their rounds. The iButtons are uniquely numbered computer chips which means they can not be duplicated. They are armored in stainless steel containers the size of your fingernail which means they are crafted for years of use. The iBR9000 hardware provides proof-positive feedback of scans with a choice of an audible tone and visible light. iButtons have a read rate of 99.999% which is 1 miss read out of 100,000.
iBR9000 Guard Tour Systems are used worldwide. We ship within 24 hours. Lifetime technical support. 5 year hardware warranty. The iButtons can be assigned as Checkpoints, Incidents and Guard Buttons enabling the guard tour systems to produce detailed time-based verification reports. A leather wallet containing iButtons is available so the guard can record incidents during his guard tour. Periodically, at intervals of your choice, you place the iBR9000 next to your computer and use the guard tour software to transfer the information directly from the iBR9000. The guard tour software produces many different types of verification reports and they can be grouped by Client, Site, Wand, Guard and Time. Graphical reports show the number of scans or the time between scans. Totals reports show the number of scans the Guards are performing by button type and site. Exception reports allow you to specify the number of scans that should be performed within a specified time frame. All reports can be filtered to include only the Clients, Sites, Guards, Checkpoints or Wands that you want in the report and the reports can be emailed or distributed electronically. "Safety and security tours at Liberty Science Center using state of the art iBR9000™ Guard Tour Systems are just phenomenal. Tracking incidents, safety equipment and guard tours has never been easier. Using the automated equipment and software has increased productivity many times over with guaranteed results. The iBR9000™ is durable and virtually indestructible." 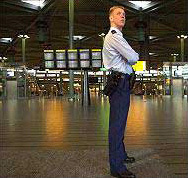 "The ease and reliability of the iBR9000™ has allowed my security staff to perform their guard tours with accuracy. It offers superior performance in any environment which requires a rugged, reliable guard system." "All I can say is that I have found the iBR9000™ Guard Tour Systems to be compact, sturdy, reliable and simply stated - it gets the job done"
Size: 2.7" x 1.67" x 0.85"